The Blended Finance Taskforce and Convergence released in July 2017 a working paper that aims to expand the evidence-base around the potential for blended finance to narrow the SDG funding gap. The working paper analyses Convergence dataset of nearly 200 blended finance transactions which have mobilised more than $50 billion towards sustainable development. The analysis shows that the number of blended finance deals is increasing each year. It shows that sub-Saharan Africa is leading in terms of number of transactions (ca. 40% of total), though with relatively small median size compared to other regions (accounting for only 16% of total capital mobilised). Financial services, clean energy, and climate finance account for half of blended finance deals and almost 75% of blended transactions leverage either junior/subordinate capital, a technical assistance facility, or a combination of both. The working paper also provides a useful map of the key organisations active in the blended finance ecosystem (including private investors, multilateral and bilateral development banks and donors). 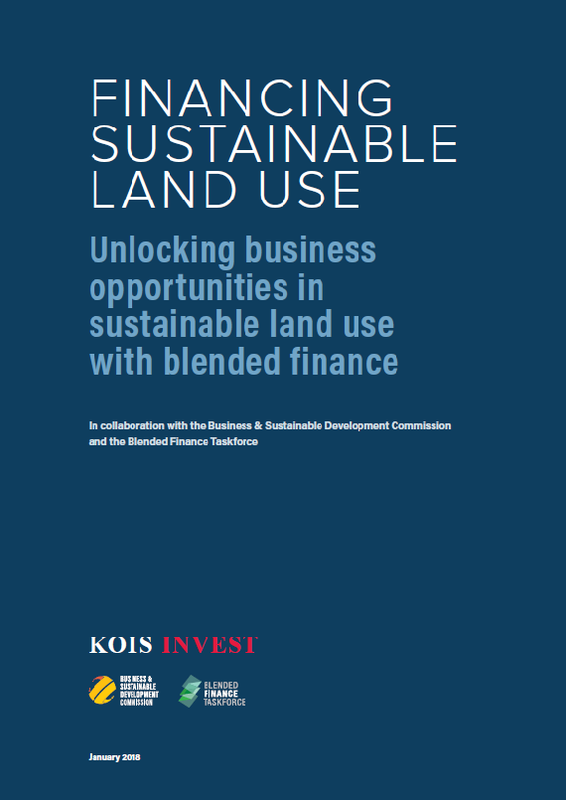 The Blended Finance Taskforce and KOIS Invest released in January 2018 a paper about blended finance for sustainable land use (SLU), analysing how blended finance can mitigate risks and enhance returns for investors in this sector. Growing demand for food and energy is putting increasing pressure globally on land and natural resources. SLU seeks to protect the climate by reducing carbon emissions and preserving carbon sinks by averting or mitigating deforestation, degradation and carbon-intensive agriculture while providing safeguards for meeting increasing needs for food and fibre as well as a habitat for biodiversity, with natural climate solutions being among the most impactful (particularly forest conservation, avoided deforestation, reforestation and forest landscape restoration). Private investment in SLU is not however at the scale needed to tackle the problem. According to KOIS, there needs to be a paradigm shift in the way in which (i) private sector investors view investment opportunities in SLU and how (ii) public and philanthropic investors engage to catalyse private capital in SDGs. Many latent SLU investment opportunities with long-term growth potential in developing countries do exist, but financing SLU requires multi-sectoral coordination to integrate programs into a holistic landscape approach. The Blended Finance Taskforce and Climate Policy Initiative (CPI) released in January 2018 a paper about blended finance for clean energy, looking at opportunities where blended finance can mobilise large scale private capital for clean energy. A rich foundation of experience in blended finance already exists in the clean energy sector, where public, philanthropic, and private sector organisations have been innovating for many years. CPI’s working paper synthesises this vast knowledge and proposes a path forward. It evaluates, by geography and clean energy sub-sector, the most significant opportunities for impact on both climate change and energy access per dollar invested; the risks and barriers that prevent investment; and how blended finance could be deployed to address investor needs. CPI finds that the greatest opportunities for blended finance in clean energy are in Sub-Saharan Africa and South and East Asia, with a subset of eight countries alone offering more than $360 billion in investment potential in clean energy by 2030. 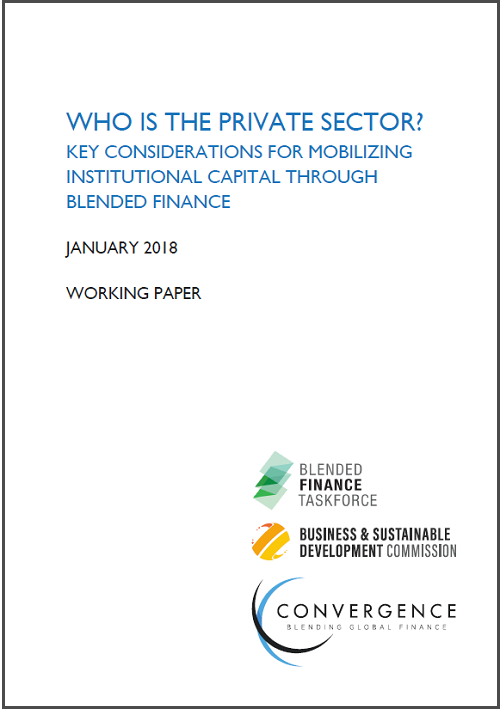 The Blended Finance Taskforce and Convergence (with Tideline in an advisory role), released in January 2018 a paper about mobilising institutional capital at scale for the Sustainable Development Goals (SDGs), using blended finance. The paper catalogues investment motivations, requirements, and constraints of institutional investors in taking advantage of blended finance mechanisms. Institutional investors make up a diverse group, each operating with different mandates, constraints, and risk-adjusted return preferences. However, they are often treated as a homogenous group of investors, while there is value in better understanding the unique investment preferences and regulatory conditions of different segments. The report provides an analysis of the investment motivations, requirements, and constraints of six segments of institutional investors: i) pension funds, ii) insurance companies, iii) sovereign wealth funds, iv) commercial banks and investment banks, v) private equity firms, and vi) asset/wealth managers. Blended finance structures must create assets that fit within the mandates, constraints, and risk-adjusted return preferences of each institutional investor segment. Based on their research, there are five key considerations that will determine whether and to what extent an institutional investor participates in blended finance: i) communication and messaging, ii) policy and regulation, iii) mandate, iv) allocation and capacity, and v) transactional factors.